"Under the paving stones, the beach!" 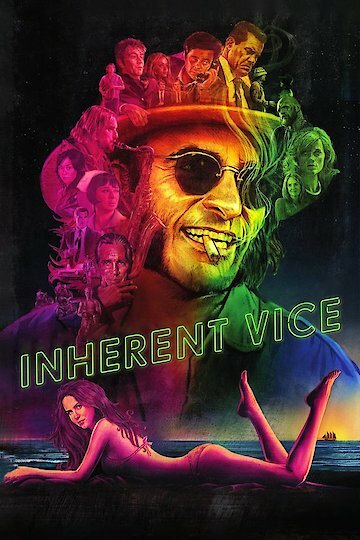 Based on the novel of the same name by Thomas Pynchon, Inherent Vice is the story of Larry "Doc" Sportello, a private investigator in early 1970's Los Angeles. A psychedelic tale told in a mist of marijuana smoke in which Doc is investigating the disappearance of his former girlfriend Shasta and her current lover, real-estate tycoon Mickey Wolfmann. A world in which Doc does not quite know what is real and what is not, and all the the while he has to contend with cops such Lieutenant Detective "Bigfoot" Bjornsen and a mysterious group known a the Golden Fang. Inherent Vice is currently available to watch and stream, buy on demand at Amazon, Vudu, Google Play, FandangoNow, iTunes, YouTube VOD online.